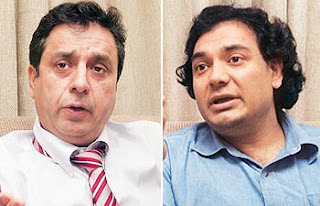 Mumtaz Khan (left) and Hasnan Sering. India is not the only one concerned with China's increasing presence in Pakistan Occupied Kashmir (PoK), especially the Gilgit-Baltistan region formerly known as the Northern Areas. Two political activists from the region also seem to be edgy about the involvement of Chinese companies in different projects there. The duo, in the Capital to attend a conference - "PoK and Northern Areas: Present Status and way forward" - organised by the Centre for Security and Strategy (CSS) of India Foundation, stated that there is a pressing need for a more proactive diplomatic approach by New Delhi in resolving the political and economic issues in PoK and Gilgit-Baltistan. Attending the conference were Mumtaz Khan, a native of PoK, who fled to Canada more than two decades ago because of alleged persecution and Senge Hasnan Sering of Gilgit, who currently lives in Washington. Khan runs the International Centre for Peace and Democracy in Toronto while Sering heads the Institute of Gilgit-Baltistan Studies in Washington. Both are well-known political activists in North America and Europe. Speaking about Chinese intervention in the region, Khan said: "Chinese companies are doing a lot of work in Pakistan Administered Kashmir (PaK). It needs to be taken seriously as it has its impact on the changing power politics in the region." The activist claimed locals have no say over the natural resources of the region. His sentiment was echoed by Sering, who is busy advocating a cause of 'genuine autonomy' for Gilgit-Baltistan on different platforms across the globe. Sering claimed that the natural resources in Gilgit-Baltistan are being exploited by Pakistan. "All the mining sites in the region were given to Chinese companies who are strengthening their bases there," he said. Media reports said that in 2011 around 11,000 Chinese troops were believed to be in PoK. The duo felt the international community and India in particular should play a proactive role in resolving many political and economic issues in the region. "If Pakistan can pass the 18th amendment and give more powers to the provinces, why can't it think of giving more powers to the government in PaK? Even the leadership in PaK is vocal about its unhappiness with Pakistan," Khan said. Taking a dig at Pakistan, Khan said the country never wanted to resolve the issue. "The control of so-called Azad Kashmir lies in the hands of the Kashmir Council run by Pakistan. The Muzaffarabad assembly has been rendered useless," Khan said. He stressed that people in PoK are living in fear and there is no freedom of expression. "At least we hear some news from the Indian side of Kashmir, but from our side there is complete blackout. PaK has been turned into a cantonment and nobody can escape from the eyes of the security agencies." Sering argued that Pakistan can do nothing for Gilgit-Baltistan as constitutionally it is not a part of the country. "It (Pakistan) just exploits our resources and wants to continue with its political hegemony. Even the latest empowerment package is a farce as the power centre continues to be in Pakistan," Sering said. "It has given us a pseudo provincial status but all our matters are decided by Gilgit-Baltistan Council that is controlled by the Pakistan establishment," Sering said. He added that he is frustrated with New Delhi's stance. "It needs to be more proactive and practical rather than confining itself to issuing statements," he said. When asked if they see any hope in Imran Khan, both Khan and Sering smirked. "He is an extension of the Pakistan establishment," Sering said and Khan was quick to add: "He is a clean-shaven Taliban."